Mizani's display at the recent WBLS Wedding Expo in New York City. At last month’s WBLS Wedding Expo, the haircare brand Mizani offered a display of beautiful wedding day-esque hairstyles. The beauty brand was sure to include an option for natural haired brides, too. For the above style, freshly shampooed and conditioned hair was sprayed with Mizani’s D’Tangle onto wet hair. Next, sections of hair received a small amount of Curl Set (small sections for tight curls; large sections for loose spirals). Hair was twisted from root to tip, securing the ends with a pin when necessary. Tresses were air dried completely (a hooded dryer can also be used). Hair was then styled by gently untwisting and separating each twist for fullness before adding decorative flower. The above model’s hair is naturally wavy so hair was blow dried and flatironed until straight. 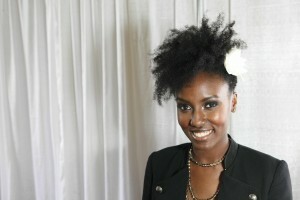 Mizani’s Smooth Guard was applied to sections while blow drying and Shine Extend while flat ironing to prevent frizz. (An excellent tip for brides tying the knot during the warmer months.) Next, a drop of Supreme Oil was combined with a small amount of Iron Curl from mid-shaft to ends before thermal styling. The stylist added vintage-inspired fingerwaves to the front of the model’s hair and secured the back into a loose chignon with a decorative comb. The back can also be worn down. 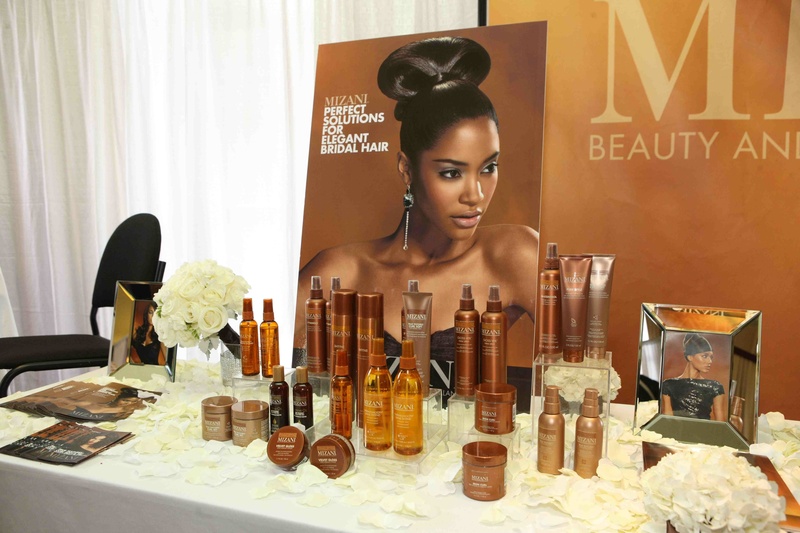 You can win a gift bag filled with FOUR MIZANI PRODUCTS exclusively through Black Bridal Bliss! Tell me the name of the natural hairstylist first interviewed on Triple B about wedding day hair. (Hint: She’s based in Arizona.) All you have to do is email your answer to blackbridalbliss@gmail.com by midnight on Friday, April 13th, 2012. You MUST be a fan of Black Bridal Bliss on Facebook in order to win. I will announce the winner here on Triple B at a later date. 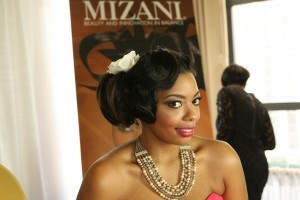 I love the CHIGNON wedding hairstyle featured for a Mizani advertisment for haircare products. I would like to get the hair do for my soon upcoming wedding. I would llike to know if the hair is added as a YAKI ponytail and is it a double ponytail? THANK YOU!